Captain Christina Cornelius logged double-digit kills for the seventh time this season in Saturday's tilt against Penn. 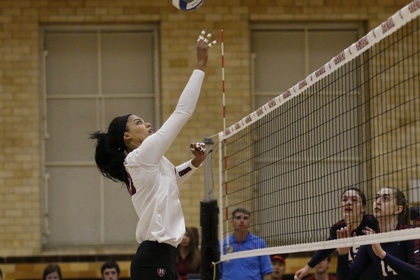 Captain Christina Cornelius and junior hitter Grace Roberts Burbank both had standout performances as Harvard women’s volleyball picked up a weekend sweep, defeating Princeton and Pennto remain undefeated at home. Cornelius had double-digit kills for the seventh time this season and led the team with 12 kills against a vaunted Tigers team that is consistently one of the top contenders in the Ivy League. The Los Angeles, Calif., native only tallied one error en route to a season-high attack percentage of .524. Burbank also had double-digit kills against Princeton after a phenomenal outing against the Quakers in which she had 13 kills. After suffering three successive losses coming into this past weekend, the Crimson had a strong showing in its past two games, spearheaded by Cornelius and Burbank. A dominant victory against Penn on Friday winning in straight sets (25-19, 25-21, 25-19) had Harvard coming into its game against the Tigers on Saturday confident and motivated for a win. Princeton had yet to lose a conference game and had a strong record of 11-4. However, the underdog Crimson was not intimidated by Princeton’s attacking prowess, and exploited the visitors’ errors throughout the game. After a defensive start, Harvard won the first set and capitalized on Princeton’s errors. During the next two sets, clutch play and strong defense allowed the Crimson to pull away and win in straight sets (25-20, 25-19, 25-23). Harvard’s victory against the Tigers demonstrates that it has the capability to compete with the best in the league and is a promising indicator that the team can close out the season with a strong record. The leadership and clutch play of Cornelius propelled the Crimson to its dominant performance this weekend. At the end of the game-clinching set against Princeton, Cornelius had three kills and was critical in winning the set and the match. She has had consistently strong games throughout the season and acts as a stabilizing force for the team. Burbank has also been integral to the team’s recent string of success. Without her in the beginning of the season, the team was 2-4, and since her return to the lineup, the team has been 5-3 with six double-digit kill performances from the junior. After a weekend that has changed the momentum of the season, the women’s volleyball team will be a force to reckon for the rest of the Ancient Eight if it keeps up this level of play. Next week, Harvard will go on the road against Brown and Yale where it will look to build off its stellar games this past weekend.